Although wood makes up some of the most beautiful features of any home, it’s not going to last forever. People, pets and the natural environment all play a role when it comes to the wear and tear wood faces during its lifetime. But there’s no need to stress, a little preservation goes a long way! From cedar shingles to decking, North East Home Improvement offers a wide variety of products to keep your wood in the same beautiful condition it was in the day it was installed. We have years of experience maintaining and preserving all types of wood. Let’s take a look at roofs for example. Cedar shingles have a hydrophobic oil coating that helps keep the shingle from drying out. It also acts as a barrier against water. Think of it like a duck’s feather – water slides right off of it. Why does this matter? The oil fades over time and shingles can begin to dry out and crack or warp. This is where a little treatment comes into play. The same goes for that deck of yours. In the summer months especially, the sun’s powerful rays combined with the elements can be a recipe for disaster. See the difference we can make in restoring your deck or porch to their original beauty. 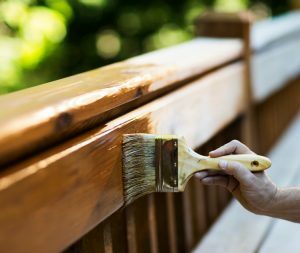 For more information about wood preservation, give the experts at North East Home Improvement a call today! (203) 321-6695.